Samsung’s entry into the hybrid stakes has some compromises, but is a worthy competitor and a fine camera. 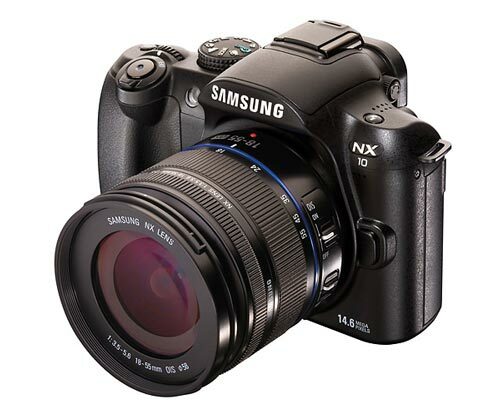 The NX10 is Samsung’s take on the mirrorless DSLR style interchangeable lens digital camera. This new generation of cameras promises to bridge the gap between the world of compacts and DLSRs, offering the best of both segments – a small form factor crossed with a modular high performance lens system and DSLR levels of speed and handling. These hybrids are also known as EVIL cameras (Electronic Viewfinder Interchangeable Lens) and they’re a hot trend right now, with major manufacturers hurrying onto the bandwagon. Contrary to popular belief, the NX10 doesn’t make use of the Micro Four Thirds lens and sensor format; instead Samsung has opted for a much larger 14.6 MP APS-C sized sensor, paired with its own range of in-house lenses. First impressions of the box of goodies supplied by Samsung was favourable indeed, with two lenses and an external flash unit hinting at the flexibility of the system. The NX10 body is as compact as expected from a mirrorless design and weighs in at a mere 353 grams without battery. It’s nicely finished at the price, with decent quality plastics all round. The overall quality won’t be mistaken for a professional level build but it easily matches equivalently priced DSLR bodies. Handling is exceptionally good, with the controls nicely located, clearly labeled and properly thought through. Rubberised strips in the right places make the grip feel comfortable, with no hard edges to irritate the hand. The non-swiveling high resolution 3 inch AMOLED (Active Matrix Organic Light Emitting Diode) screen is as bright and clear as anything you’ll find on any camera near the price, even though it can’t match certain pro-level (ie, expensive DSLRs) for outright resolution. The EVF (Electronic Viewfinder) is also very good but nowhere near as bright as the screen. It’s got good resolution and less flicker or optical effects than most of the competition. Still, as good as the EVF is, it’s no match for the plain old mirror on a DSLR in terms of speed or providing an accurate representation of what the lens is seeing, because you’re still seeing a screen’s interpretation of the subject. Having access to the full menu and playback system in the viewfinder is handy though, and very easy to get used to. A sensor instantly switches from screen to EVF when the camera is lifted to eye level. The NX10 offers simple scene modes and smart auto functionality, which cater to novice users as well as manual modes for those who want more control. It will shoot in RAW mode and can also capture 720P HD video clips. 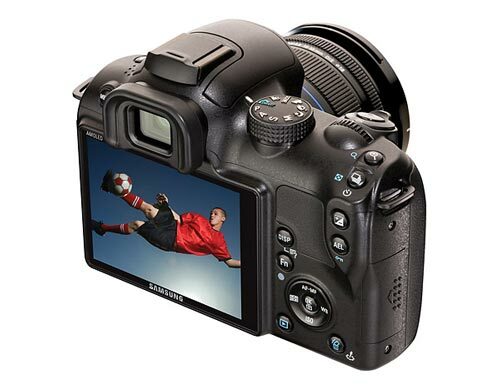 Negatives include the fact that Samsung has opted for a micro-USB connector on the NX10. There’s enough space for an HDMI slot nearby, so there’s no real excuse for this non-standard connector; if the cable goes missing, it’s impossible to just grab a spare from another USB device. Another negative lies in the nature of the beast – it’s mirrorless, so every time you change a lens, the sensor is exposed to the world in all its naked and very vulnerable glory. The NX10 is fitted with a sensor cleaning system but sooner later, some gunk that the cleaning system can’t remove is going to end up on the sensor. The same gunk probably wouldn’t have made it onto a DSLR sensor but then again, the DSLR would be much bulkier than the compact NX10. Compromise has always been a fact of life in camera design and all hybrids bar Ricoh’s GXR have this problem. The NX10 was supplied with two lenses, a fixed pancake (or extra slim) 30mm F2 and an 18-55mm F3.5-5.6 OIS zoom. A 50-200mm F4.0-5.6 OIS zoom is available with additional lenses being rolled out during 2010 including a compact zoom, wide pancake, macro and super zoom. An adapter is available to mate Pentax and Schneider branded K-Mount lenses to the NX10. The 18-55mm (27-83mm in 35mm terms) looks and feels a bit basic, with a shiny plastic finish that doesn’t match the quality of the NX10 body. Similar basic zoom lenses supplied with entry level DSLRs look and feel much the same, so it isn’t really a big deal at the price. It’s got built in stabilisation; a nice bonus and it’s sharp and relatively distortion free. At F3.5-5.6, it’s not exceptionally fast, although no kit zooms are. The 30mm F2 pancake lens (45mm film equivalent) on the other hand is a beauty, and it’s what I used for a fair chunk of the review shots. It really is a slender piece of glass, weighing in at under 100 grams and adding less than 20mm to the depth of the NX10 when mounted. It’s sharper than the zoom (as expected) and with a maximum aperture of F2, it’s great for creating shallow depth of field shots. It’s also considerably better than the zoom in low light conditions when a flash is contra-indicated. If using a fixed lens seems somewhat archaic in these days of 18-270mm superzooms, I can assure you that your photography will improve in leaps and bounds if you persist with it. because it forces you to move to find the shot, rather than just staying put and zooming in and out like a closed circuit camera hoping to find a shot of some kind in the zoom range.